Have you ever wondered if skin toner is the pet rock of beauty products – basically an attempt to get you to spend money on something you don’t need? I have! The short answer to that question is that consumers that are slathering hormone-disrupting, synthetic cleansers on their face probably don’t need toner. However, if you use a natural cleanser, toner can really benefit your skin. I’ll explain why in this post, and share a simple recipe that you can make in under five minutes. Soap, though fantastic for grimy armpits and such, is not great at preserving our skin’s built-in protection system: the acid mantle. When we wash with soap, two things happen . . .
1. We remove debris and transient bacteria from the environment. We also rinse away some of the good bacteria that are part of our natural microbiome, but those bacteria also live in the deeper layers of our skin that water doesn’t touch and therefore quickly repopulate. So, how does apple cider vinegar benefit skin? According to Dr. Bowe, apple cider vinegar “returns acidity to your skin and the malic acid in apple cider vinegar makes it antibacterial, wiping out bacteria.” Using a toner made with apple cider vinegar restores pH, and then all you need to do is smooth on moisturizer and you’re done! 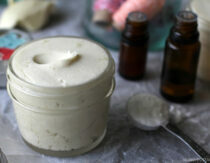 I recommend this this hydrating skin repair face serum recipe or homemade tallow balm, which is uniquely compatible with our skin’s biology due to it’s similarity to the sebum that makes up our protective layer. 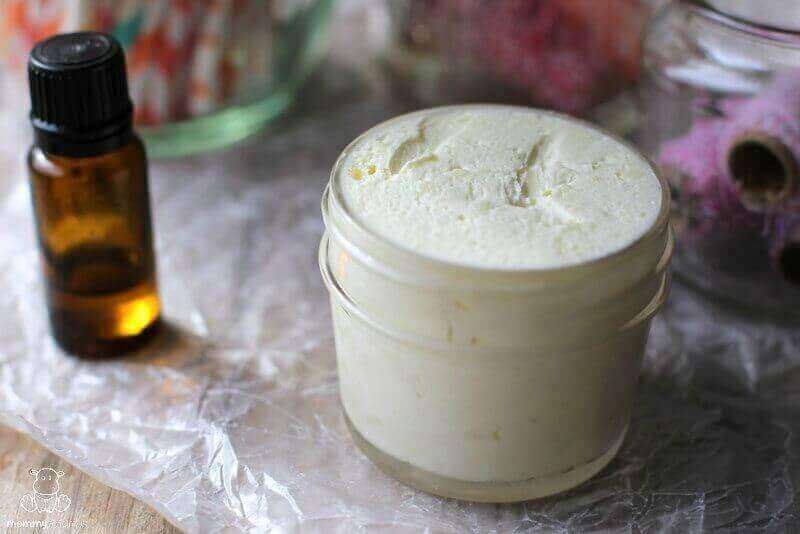 If you don’t have easy access to tallow or are short on time, my friend Emilie sells pre-made tallow balm blends that smell amazing. 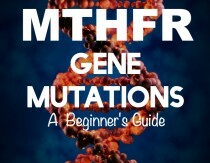 If you want to try it out, click here and use MOMMYPOTAMUS at checkout for 10% off your first order. What are the benefits of apple cider vinegar for acne? Should I add essential oils? It depends. I’ll explain in more detail below, but basically what you need to know is that different ratios of apple cider vinegar to water work for different people. If the formula that works best for you contains less than 50% apple cider vinegar, the essential oils will not disperse and instead will float on the top of the toner, making it very difficult to get an even application. Organic Calendula Hydrosol – Gentle and soothing. Good for all skin types. Organic Lavender Hydrosol – Similar to calendula in properties, but smells like a field of lavender. Organic Helichrysum Hydrosol – Often called “The Everlasting Flower” due to it’s skin renewing properties. Organic Peppermint Hydrosol – Helpful for acne prone skin. Also makes a good homemade mouthwash. Organic Rose Hydrosol – Gentle and balancing. Good for anti-aging formulas. Organic Tea Tree Hydrosol – Helpful for acne prone skin. Because your skin is unique, the ratio of apple cider vinegar to water (or hydrosol) that works best for you may be different than what works best for someone else. In general, I recommend starting with apple cider vinegar that has been well-diluted (see the 1:4 ratio below), then increasing the amount of apple cider vinegar in the recipe if it makes your skin happy. 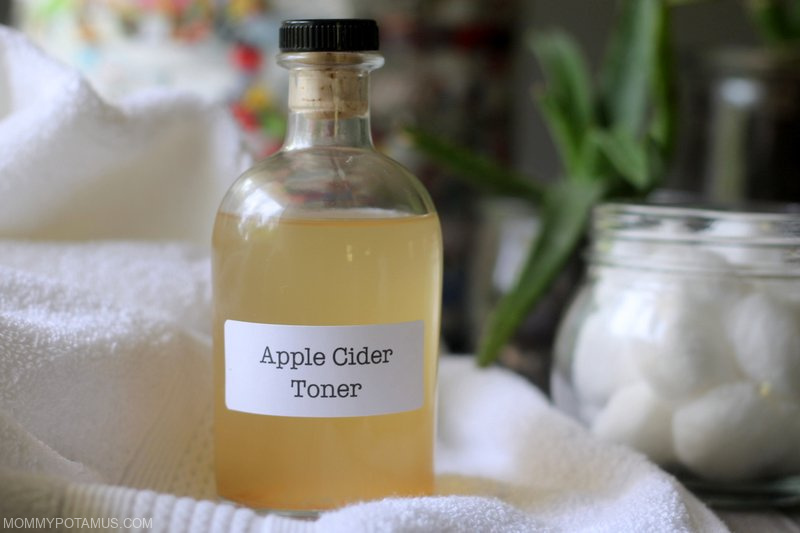 1:4 Ratio – Recommended for sensitive skin or if you’re just starting to use toner: Add 1 part apple cider vinegar to 4 parts distilled water or hydrosol. This can mean 1 tablespoon of vinegar to 4 tablespoons water/hydrosol, or 1 ounce vinegar to 4 ounces water/hydrosol. 1:3 Ratio – Add 1 part apple cider vinegar to 3 parts distilled water or hydrosol. 1:2 Ratio – Add 1 part apple cider vinegar to 2 parts distilled water or hydrosol. 1:1 Ratio – If adding essential oils, use this dilution and add a maximum of 3 drops lavender or tea tree essential oil per tablespoon of liquid. Mix the essential oils with the vinegar first, then add in the water/hydrosol and shake before using. For example, if you’re making 1/2 cup of toner, what you want to do is mix up to 24 drops essential oil in 1/4 cup vinegar, then add in 1/4 cup water or hydrosol and shake well. Apply to skin using a cotton pad or clean cloth. Some people prefer to pour it into a small spray bottle and spritz it on – that works too! Allow the apple cider vinegar toner to dry, then follow with a moisturizer like this face serum recipe. Don’t Want To Use Soap At All? If you’d prefer to skip soap altogether, try the oil cleansing method or a honey face wash instead. Recipe for the face wash coming soon! Looks great! How long will the recipe stay good? I look forward to using this! I don’t see where you add the ACV and cold water – can you add that anywhere in the process? Thanks! Hi Amber, I just checked with Aubrey and updated the instructions. Thanks for your comment – I totally missed that there was a missing step! Heather, I am confused, I have searched through the instructions for this toner and cannot find honey. I see a honey face wash link, but no amount or proportion for honey. Did I miss Audrey’s link? No problem! Thanks! 🙂 I’m so thrilled that I was introduced to your site by another fan. I love it!! I bought your DIY Beauty Care book recently and plan to make a bunch of recipes from it this week. 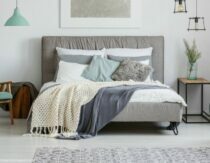 This does sound pretty amazing! I would also like to know how long it should stay good for, and if it needs to be kept in the fridge. PS- By the nature of this being a “toner” this is probably a silly question, but because of the honey, I wanted to ask… After your cleanser, this just goes strait on the face and you leave it on, right? No rinsing afterwards? And if one were to add a moisturizer to her routine…would that be ok to add after, or just a bad idea? Thank you so much! Thanks for the questions ladies! There is no need to keep this refrigerated. I make this one batch at a time and use it daily, and haven’t had any issues with expiration due to the ACV and the EO’s which helps to keep it shelf stable. I can’t speak for how long it’ll stay good for, but it’s safe to say that it’ll keep for several months. Use it as you would any traditional toner, there is NO need to rinse. You can put it in a spritz bottle (my personal preference), apply with a cotton swab, or just use your bare hands. I apply mine immediately after I wash my face. You can still add a moisturizer afterwards, just give it a few minutes to dry in between. Thanks for answering our questions, Aubrey! Can’t wait to finally make it myself this weekend! Thank you so much for this follow up information! You answered every one of my questions 🙂 Great post too! Before adding in the EO’s, it will be tempting to not spread this on a bagel! LOL! I have oily skin so I am willing to try out this natural recipe. Thanks a bunch! Hello.. I just tried this mixture today and had a quick question about leaving it on as a toner. I spritzed it on and notice that due to the honey my skin is left feeling sticky which feel a bit uncomfortable. Will you retain the benefits of the ingredients by rinsing it off a bit? Hi Monique, you can certainly dilute it a bit more if that’s more comfortable for you, or you could rinse after applying. I imagine that would diminish the benefits somewhat, but it would still be beneficial. witch hazel works great too. I tried this today and thought I’d offer my two cents. I was really excited to make this since I live/work on a farm and don’t have any A/C, I often refresh my face throughout the day using plain water or witch hazel between real face washes. I don’t like store toners because they always dry out my skin and my skin is already dry. So I made it tonight and here’s what I found: Super easy to make, whipped it up in 5 minutes. After applying it, I noticed what another poster mentioned, which is that it left my skin feeling slightly tacky, not a lot but enough to bug me. So I tweaked it, I added more water (sorry, didn’t measure…maybe 1/4-1/2 cup more?) and I also added a bit more ACV (didn’t measure that either but I’d guess a few Tablespoons more). This did the trick, now it’s perfect and leaves no sticky feeling. Oh: I also substituted the peppermint oil with a combination of tea tree and orange; tea tree for it’s astringent nature and orange because it’s good for dull skin, which I have. That combo leaves a refreshing scent too! One thing I did with this toner is pat dry with a towel (after applying it with a cotton pad),- not enough to remove it but enough to get rid of excess wetness, since there’s no alcohol in it to dry it quickly. Then I deliberately didn’t moisturize to be able to feel my skin accurately after it fully dried and was back to normal. It feels great! What amazes me is that it actually tightens my skin without drying it out. The very thing I hate about store toners is the drying nature, so this is fantastic. I don’t feel the need to go moisturize now either, which is crazy because again, my skin is very dry. I do think I’ll still need to moisturize in the winter or before makeup however, but that’s fine. I hope the extra water and extra ACV tip helps anyone else who finds it slightly tacky on the skin, that really solved the problem for me. Now I just need to label it so I’ll know how to make it again once this is gone. This will be great throughout the rest of the summer for quick refreshes when I’m outside getting sweaty. Thanks so much for sharing it! Laura, thanks for all the practical tips. I finally have all the ingredients and clean kitchen ready, so I’m hoping to try it out this weekend myself! I just made this the other day and it’s perfect; not too harsh for sensitive skin but does a great job removing the grime left behind after washing. And it is so easily adjustable. Thanks for the recipe! 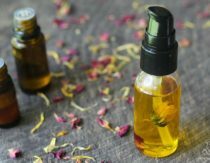 I’m fairly new to essential oil usage but the one thing I’ve noticed almost everyone, or every recipe stating, is that you need to pair it with a carrier oil to help with the absorption of the essential oil. On that note, is there a reason why you don’t add a little bit of a carrier oil into this toner? Have you experimented with adding some in and it just didn’t have the same effect as without it? I made this a couple months ago and put it into an open glass container on my bathroom counter. Guess what? It formed a little scoby! Awesome! I was worried it might go bad since it is only honey, ACV and water, but it’s still good. The honey and ACV must help keep it from going bad. I usually use witch hazel in my toners. I found that this one doesn’t clean as well as my other witch hazel one (on my oily face), but think it might be better to use in winter, when it’s dryer and harsher on skin. But I’ve been too lazy to make my other one and this works sufficiently in summer. I didn’t use peppermint, but used Frankincense instead. Hello. I love your recipes! I have questions about this facial toner: Shelf Life? Can I add sugar to this and make it a sugar scrub? I have been using this for about 3 weeks now. I find it’s a little drying. Could I add some lavender essential oil? Would I need to remake it without the peppermint? 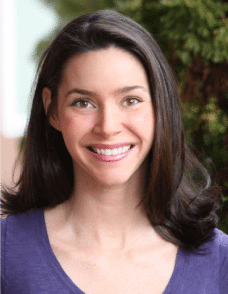 I have Heather’s DIY Organic Beauty Recipe e-book (love it!). 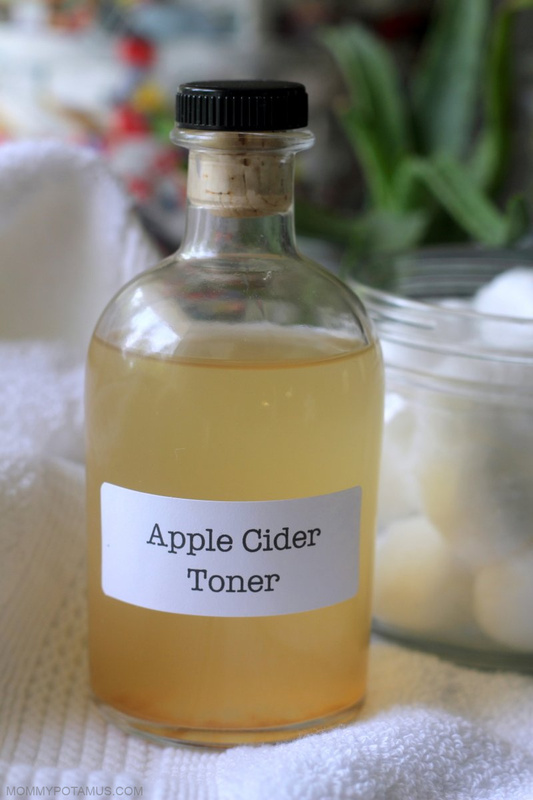 I have tried the ACV toner recipe in the book (same ratio of 2T of ACV per 1 cup water). The ACV is too strong for my sensitive skin (it becomes tight and dry). Can I reduce to 1 tbsp of ACV per 1 cup? I know the shelf life is 1 year with the 2 T of ACV and am wondering about the shelf life with reducing to 1 T? Also since I’m allergic to peppermint, I would be using lavender and frankincense instead. The lavender has antiseptic, antiviral, antifungal and bactericide properties (amongst other soothing, healing properties for skin). So that should help with shelf life, right? Hi KK, it’s totally fine to dilute the ACV more, but it will decrease the shelf life somewhat. I’m not sure exactly what the new shelf life would be, so if it were me I’d make smaller batches more often. Hope that helps. Any DIY product made with water will develop bacteria within about 20 minutes. I really don’t know if the ACV helps 100% to keep the micro organisms away or not but I would be cautious with this. The bacteria is not visible! After studying skin care formulation recently I am concerned about no preservative in the product. Honey is a natural preservative…for honey, it won’t mold. But when you add honey to something with water, bacteria will grow. The recipe sounds wonderful and I will try it for a one time application by reducing the amount of each ingredients and leaving off the essential oil. I am semi new to essential oils. I live on an island and summer is approaching, therefore spending a lot of time on the beach. Is peppermint essential oil photosentive? Will it react with the sun? Hey, is it normal to feel that slight coldness on your face after you applied it? 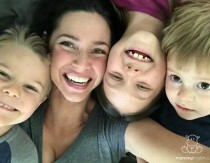 I found out the hard way (another facial cleanse recipe) that I’m allergic to honey topically. I know honey is the star of this toner, so it may not be possible to replace it, but any suggestions would be much appreciated! Heyyy ! I’ve tried this recipe right after receiving your email a week ago, and have been using for approximately 7 days now. And…my mum and (girl)friends have all told me my skin looks amazing, “so perfect, what did you do to it?”. I’ve been using this toner just about every day and love the results. I made it with rosewater so it smells divine. 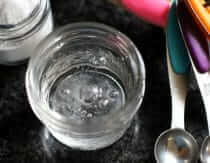 I use it after an ACV exfoliating scrub I created and I’ve seen my dark marks lighten and my pores have gotten smaller. Hi Heather! I am going to try this remedy As soon as possible. But, I have one question, After putting the ACV toner in my face and leave it like for 20 or more minutes can I rinse it off with water then put my moisturizers after? Does it still works if I do that? I just really don’t like the smell of it and I really think it would smell more bad if I add it with my moisturizer. The research I read didn’t look at that scenario so I’m not sure. I think you would get some benefit. Do I need to drop the EO directly to the vinegar? Or should I dilute it first with some base oil? This really sounds great! However, I’ve used apple cider to cure my sore throat and any signs of cough haha I never knew that this can be a formula for a face toner. If you don’t clean your face with soap but rather a Norwex body cloth and water (or occasionally the oil cleansing method) is toner still necessary?